Orlando Arcia faced an uncommon defensive alignment when he came to the plate with the game on the line in the ninth inning and a chance to help the struggling Milwaukee Brewers pull off a win over their heated division rival. 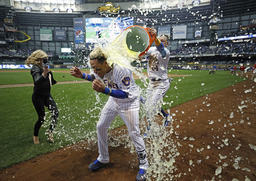 Against a five-man infield, Arcia flared an opposite-field single to right with one out, lifting the Brewers over Chicago Cubs 5-4 on Friday night. "At that point I'm just trying to make contact, get the ball to the outfield and try to get the run in," Arcia said. With the score 4-all, Manny Pina drew a one-out walk off Mike Montgomery (0-1). Pinch hitter Hernan Perez hit a slow roller and dove into first as the throw from third baseman Kris Bryant skipped past Victor Caratini for an error that allowed Pina to advance to third. "I honestly shouldn't have even thrown it. He was safe all the way," Bryant said. "I was just trying to make a play there." Arcia's hit set off a celebration near second base. "Those situations are going to make you better as a player, so to come through makes it even better," Arcia said. Matt Albers (1-0) allowed one hit in two scoreless innings for his first win for the Brewers, who got a boost from two-run homers by Eric Thames and Travis Shaw. Held scoreless for 22 consecutive innings and trailing 2-0 entering the fifth, the Brewers got a spark when reliever Josh Hader led off the inning with his first major league hit. Two batters later, Thames tied with game with a homer to straightaway center off starter Kyle Hendricks. Ryan Braun singled, and Shaw homered for a 4-2 lead. 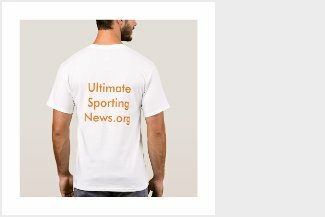 "It felt good to score again," Shaw said. "It's been three days. Hader's first hit was exciting. We kind of woke up after that fifth inning." Chicago tied it in the sixth when Javier Baez hit an RBI triple off Jeremy Jeffress and came home when second baseman Eric Sogard's throw skipped wide of third base for an error. Milwaukee put runners on second and third with no outs in the bottom half, but failed to score. After three straight two-out walks by Justin Wilson in the seventh, Steve Cishek relieved and struck out Lorenzo Cain. Hendricks allowed four runs and nine hits in five innings. Milwaukee's Brian Woodruff, making his first start after a pair of relief appearances, gave up two runs and four hits in 3 2/3 innings and 95 pitches. Russell and Caratini hit RBI singles in the first. Hendricks said he expects the Cubs and Brewers to wage an intense battle for the NL Central title. "We know they are going to be there all year at the top of the division with us," he said. "We know they are a deep, resilient bunch. It's going to be a dogfight." Bryant also expects a season-long fight. "They seem like a fun group over there," he said. "Sure, it can get a little annoying, but we do the same thing. It's a nice little rivalry." The gametime temperature stood at 64 degrees inside Miller Park and a frigid 30 degrees outside. The Cubs are the only team yet to have a home game. They are scheduled to play at Wrigley Field on Monday against the Pirates. When the series with Milwaukee concludes on Sunday, the Cubs will have opened the season with nine games on the road, the longest stretch for the franchise since the Chicago Orphans played their first 12 games away from home in 1899. Bryant was in no rush to return to Wrigley, given the current weather conditions. "It's really cold in Chicago," he said. Cubs: 1B Anthony Rizzo didn't play due to back tightness. "He did a lot of extra hitting yesterday," manager Joe Maddon said. "I'm not overly concerned." Brewers: All-Star closer Corey Knebel went on the DL because of a strained left hamstring and is expected to miss four to six weeks. ... RHP Adrian Houser was recalled from Double-A Biloxi. Houser made two relief appearances for Milwaukee in 2015 and had Tommy John surgery the following year. "It's definitely been a long journey," Houser said. ... OF Christian Yelich missed a second consecutive game with right oblique tightness. RHP Yu Darvish (0-0, 10.38 ERA), who is to start Saturday for Chicago, allowed three runs in five innings last season for the Los Angeles Dodgers in his only previous appearance against Milwaukee. Brewers RHP Zach Davies (0-1, 9.53) is 5-4 with a 3.90 ERA in 10 starts against the Cubs.